H2 Designs: Door Hanger Challenge!!! This week there is a Door Hanger Challenge at Michelle Perkett's Studio to celebrate reaching 300 members! 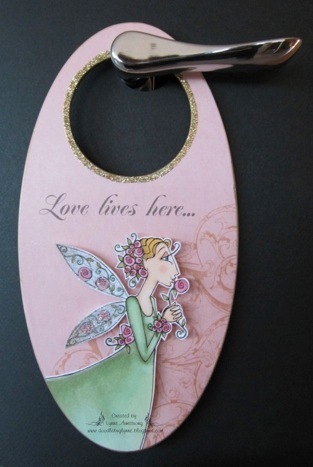 Here is a photo of a door hanger made by the very talented Lynne using the beautiful digital stamp "Amore Fairy" by Michelle Perkett. Hop over to Paper Craft Planet & join in the fun!